Becoming a parent was most definitely unlike any other experience I’d had to date. Other than knowing some basics of taking care of kids from my teenage babysitting years and watching (from a safe distance) a few friends and colleagues enter the world of new parenthood, I didn’t have much real-life knowledge of how it would go. There was a pretty big gap between the number of internal reference points I had for other tough life experiences and the number of parent-related reference points I could draw on when our first baby arrived. To fill those gaps, I needed information about how the rest of the world did things like coping with baby reflux. Heading back to work on no sleep. And sterilizing pump parts. So I did the inevitable: I compared what I was doing to how others around me were managing. Sometimes, these comparisons proved to be really helpful in teaching me new tricks of the trade. Benchmarks can, of course, be useful tools. But other times, these comparisons served to make me feel pretty crappy: I was pretty excited about that 4-hour stretch of sleep my baby got. Until I learned that my friend’s son who is the exact same age slept 12 straight hours. I thought I had returned to being a productive employee. Until I had to miss an important meeting because my baby was sick, and all my other colleagues were there. I thought my baby was developmentally on track, but a friend’s baby was walking by 8 months. And when I walked past all my diligent coworkers’ offices to get out the door at 4:30pm to get my baby from daycare, I felt like a pretty big slacker. I’m five years into the parenting thing, and reframing unhelpful comparisons is still a work in progress for me. I’ve learned, however, to start asking myself how I truly feel about something, rather than whether I’m on some sort of “right” track or not. 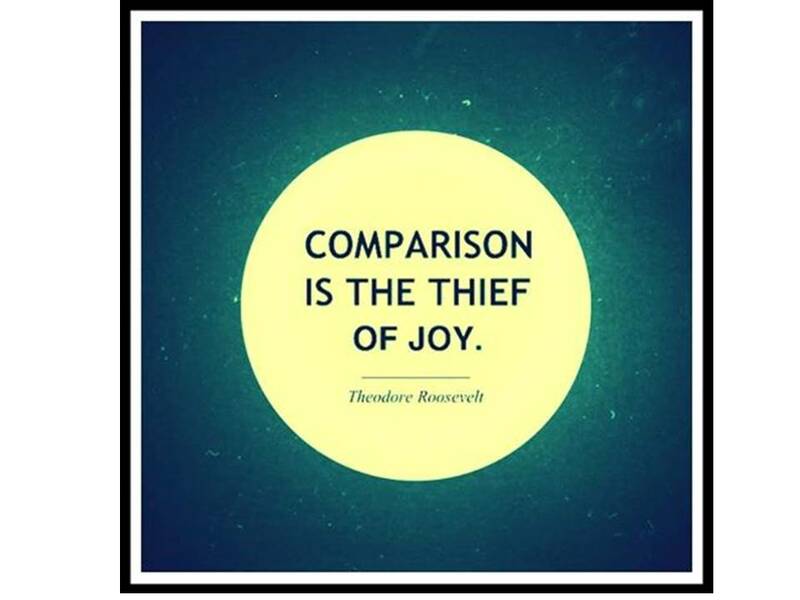 And last year, one of the mamas in the Mindful Return E-Course taught me the manta “comparison is the thief of joy” (apparently a Teddy Roosevelt quote) – which I now remind myself of daily. 1. Figure out what it is you’re comparing. If you feel like you’re somehow falling “short”, remind yourself that “short” is a word that implies a comparison to something else. Then ask yourself: is the comparison to your own expectations? If so, perhaps it’s time to adjust them, just as everything else in your universe that now involves keeping another human being alive has had to change. Or, is it the comparison to what “everyone else” is doing or perhaps what so-called “society” says you should be doing? If so, it’s time to turn inward and stop making those other people the yardstick. 2. Reconsider whose schedule you’re on. 3. Compare yourself instead to those who inspire you. Given that comparison may be inevitable, my recommendation is to find some people who inspire you – perhaps on the calm, or balance, or creativity, or daring front – and compare yourself to them. Not for the purpose of falling short – but for the purpose of learning from them those qualities you aspire to. I do leave at 4:30pm to get my kids nearly every day. And I’m intentionally on a 60% schedule at work. I may not be “keeping up” with others by some standards, but this pace works for me. To use comparison for good, I now dare to ask: Can I be as thoughtful as she is? As committed to being healthy as she is? As gracious and empathetic as I just saw him be to his team? It is much more fun to be inspired by – rather than feel threatened by – other people. 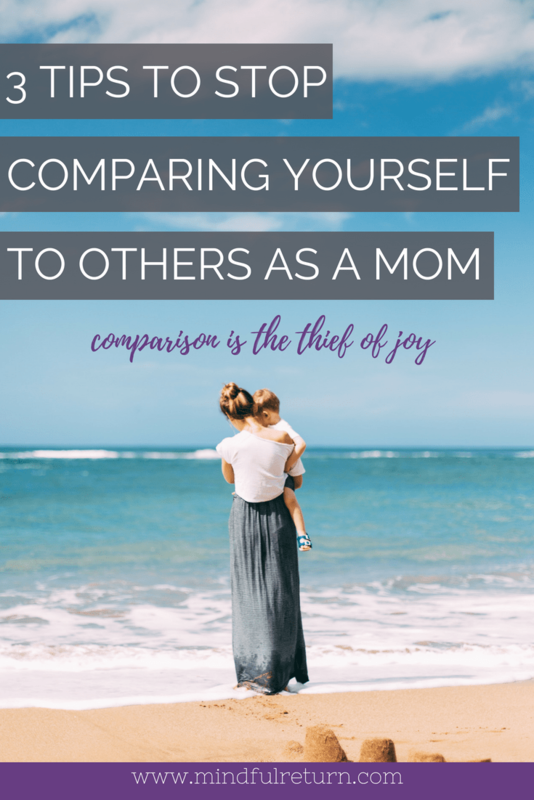 Comparison IS the thief of joy, mama. Life is too short to let yourself steal your own joy. For more help getting your head in a good place during the return to work after maternity leave, join the next session of Mindful Return. Sign up now to get FREE weekly email tips for working mamas! This really spoke to me, the idea of falling short compared to friends is definitely something that crops up for achievement-oriented career women! Thank you for this helpful and thoughtful post and for your blog in general. It’s been phenomenally helpful! I hear you on how this comes up for those of us who are focused on achievement and our careers. So glad it resonated and that you find the blog helpful! Thanks for weighing in.